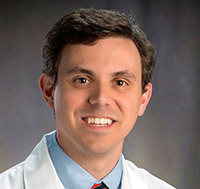 Dr. Baschnagel is a radiation oncologist and assistant professor in the Department of Human Oncology at the University of Wisconsin School of Medicine and Public Health, Madison, WI. He specializes in treating patients with lung, esophageal and other thoracic malignancies. He also has experience in performing stereotactic body radiotherapy and intracranial stereotactic radiosurgery for the treatment of brain, spine and liver metastases. He is actively involved in UW Multidisciplinary Thoracic Program and works closely with thoracic surgeons, medical oncologists, pulmonologists and radiologists to best meet the needs of our patients. In addition to patient care, he is actively involved in translational and clinical research at the regional and national level. Dr. Baschnagel’s research focuses on translational and clinical research. He works closely with basic scientists, physicists and clinicians with the goal of fostering new ideas and translating research findings into the clinic. He has experience in studying combinations of radiation and molecular targeted agents and biomarkers of treatment response in patients and in preclinical models. His current work focuses on improving treatment of non-small cell lung cancer, esophageal cancer and head and neck cancer.